A futuristic world with robots that have human-like skin and humans have realistic bionic implants may not be quite so far off thanks to new research from the University of Naples Federico II and Italian National Agency for New Technologies (ENEA). Long known for its ability to conduct electricity, the researchers have been able to modify the structure of eumelanin—the pigment that colors human eyes, hair and skin. Naturally-occurring melanin can be found in nearly all life forms. It is nontoxic, biodegradable and doesn’t trigger an organism’s immune system. This makes it an ideal solution as a coating for medical implants or internal devices. One issue researchers have faced is the disorderly nature of eumelanin at a molecular level. Previous research focused on increasing its conductivity by adding elements, such as metals, but this meant the material was not biocompatible. 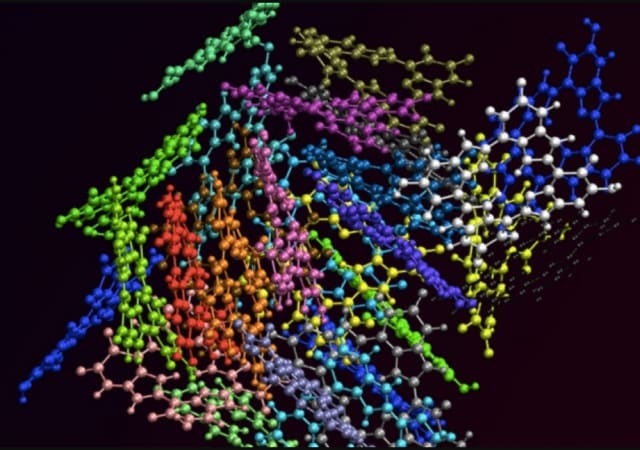 Pezzella and his colleagues, including Dr. Paolo Tassini from ENEA, decided the best way to deal with something in disarray was to try neatening and aligning the electron-sharing molecular sheets. Using an annealing process—a method of heating metal or glass and allowing it to cool slowly, removing internal stresses and strengthening it—in a vacuum created a billion-fold increase in its electrical conductivity. The team heated the eumelanin films, which were no thicker than a bacterium, anywhere from 30 minutes up to six hours. The result was a material that was dark brown and as thick as a virus. The material was dubbed High Vacuum Annealed Eumelanin (HVAE). The fact that the material did not burn with temperatures of to 600°C supports their theory that the structure was reorganized, which is a giant step toward further developing uses it for it. However, the material did show one downside: once immersed in water, it lost some of its conductivity. Interested in more ways researchers are looking to biology for innovation? Check out Spider Silk for Robotic Muscles and A Lesson from Reptiles: How a Snake’s Motion Can Inspire Better Robots.